Countries like Estonia had their own crisis early and have recovered well, while countries like Germany and the UK have yet to experience a jobs crisis. Indeed, while the numbers out of work increased slightly in the UK, the total number of people in work has increased year on year, because the workforce has grown. One reason has been more people continuing to arrive in the UK from other EU nations, hoping to find work. The UK job market has changed during the crisis, with rapid growth in numbers of people working part-time, especially in those over 50, many of whom have embraced the change as part of a new chapter in life. With the age at which people are retiring getting older, and with more people needing to find some additional income after retirement, this pattern of older part-timers is set to continue. However, countries like Spain have seen meteoric rises in unemployment, particularly among 18-15 year olds, where some areas are seeing jobless rates in excess of 40%. Once again there are other factors going on when you peel below the surface. Family structures are very strong in Spain, and many young people are surviving by going to live with parents, helping out informally with family businesses and so on. The informal economy has always been sizeable in Spain and it seems this sector may be growing rapidly as in Greece and Italy. What do you do to survive if your earnings are 25-40% down on last year, if you have had to swop a secure salary for informal part-time, temporary work? Once strategy is to keep the cash, don’t declare it, don't’ pay tax, and disappear from official statistics for people in work. Another example of Two Europes is in the cost of borrowing – or rather the opinion of investors about the ability of your government to survive without defaulting on debts. 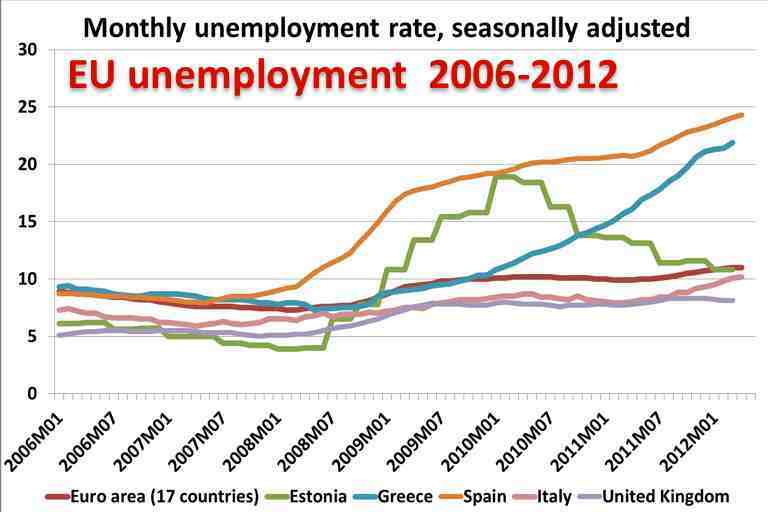 Just look at the differences in the rates for Greece, Portugal, Ireland, Italy and Germany. What is important about this graph is the timescale, going back to 1995. You can see clearly how out of step these kind of interest rates are with anything in recent history. But here again, there are other factors we need to understand. 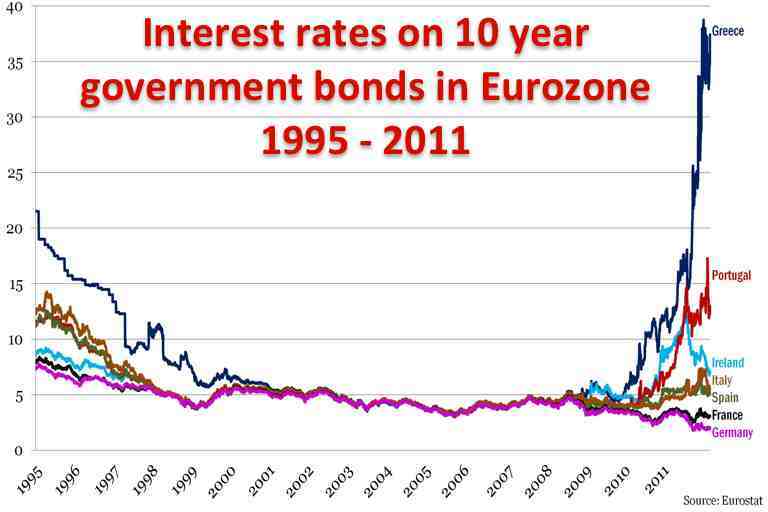 For a start, these interest rates are not being charged on all the government debt in – say - Greece. They are simply the rate that the government had to offer on that day, to persuade investors to save some additional money in the government’s private bank account for a fixed period of 10 years. A decade is a long time in today’s world. The investor is being forced to take a bet on what the inflation rate will be. The difference between that and the interest rate offered will be the real return on their investment (assuming no default). So ordinarily, investors would only demand an interest rate of almost 40% a year if they were convinced that inflation would be running on average at somewhere above 35%, which is clearly nonsense. Investors are taking a bet, assuming that there is a very high risk that they will get none of their money back at all, or only some of it. And to insure against that risk, they want a risk premium. Of course, if Greece actually does limp along for a decade, and pays all that interest, and repays all that debt, the investor will have made a spectacular return. The truth is that even with a “promise” from the Greek government of around 40% a year of interest, many investors are running scared. They just do not want to take the risk – at any price. Instead they have been pouring money into the bank accounts of governments like Germany and the UK, who have been overwhelmed by demand for their own bonds. Germany has been able to get away with offering as little as 1-2%, which is less than current rates of inflation, meaning that investors are actively choosing to make a loss. So Germany has been actively benefitting from fear of Greeks, Italians, Spaniards. Can a country survive if the government has to pay over 20% a year on what it borrows? The answer is no, if inflation rate is a fraction of the interest rate, and if >20% rate is applied to all their borrowing. However, it only applies to the new borrowing that government needs to make that month. It is as if a home owner has a mortgage for EU200,000, but it is divided into 20 loans of EU10,000 each, of which each loan comes up for renewal every 5 years, on a different month. So most months the home owner has to take out a new loan for around EU10-20,000 at the best rate he or she can get that month. The problem for Greece and Italy is that so much of their piles of national debt all came up for refinancing at the time of the crisis. In comparison the UK government has been in a very comforting position, with most of £1 trillion of debt issued shortly before the crisis and not due to be renegotiated for some years. The underlying fact is that Greece has more debt than can possibly be repaid, even at zero interest rates. And every time it tries to repay debt, it does so out of more borrowings, or by cutting government spending, or by increasing taxation. All three of those strategies are useless as they make the underlying situation even worse, crippling the future of the country just as it is trying to recover. Expect therefore that at some stage there will be a massive write off of most of the Greek debt. They may write it off because those who are owed the money realize it will never come back anyway, and writing off most of it means a little of the rest might just be repaid. Or the Greek government may take matters into their own hands, announce they are leaving the Euro and are not going to repay. Would that be such a disaster? Many other nations have been in as bad a crisis or worse, over the last 20 years, and have recovered. In every case they did so in the same way. They allowed their currency to collapse, as investors sold out, and also refused to honor some government debts. The currency fell to a point where everything in the country started to look like a bargain and investors began pouring money back in again. The currency settled down at a lower level, making all exports cheaper, and imports more expensive, making life cheaper for tourists coming in, and for anyone from another nation wanting to buy property. But Greece is locked into an unsustainable economic hell: because it is part of the Euro, it cannot depreciate the currency. Instead it is forced to have the same exchange rate as Germany and France. What are your own views on the Future of Europe? Please do comment below.